When this movie came out in 1959 it was meant to be wholesome family entertainment. It’s terrifying. I saw it as a child one stormy day and have lived in fear of fairies every since. Darby is a good man who’s a bit of a slacker. He and his daughter are about to be kicked out of their home because of his habit of drinking instead of working. Thankfully his replacement, a very dapper, singing Sean Connery, adds some levity. Darby ends up extorting three wishes from the fairy king. They go rather badly; like death’s carriage in the sky and a banshee that still appears in my nightmares. While it has a happy ending, it’s spooky enough to be a scary movie for eight-year olds and people like me. This Irish/American independent film tells the story of Fiona, a little girl who is sent to live with her grandparents. While there she discovers her family tree may include a selkie – an Irish seal shapeshifter. Fiona has a baby brother, Jamie, who has been lost at sea. She comes to believe her selkie ancestor is keeping him. Convinced the selkie will only return Jamie when their family lives on the island where the seals live, Fiona sets out to make that happen. This movie is filled with magic and I rewatch it every year. It’s responsible for at least three of the characters in the Death Witch series. NPR’s Celtic music show, Thistle and Shamrock, is a weekly listen in my life. Unfortunately, there are weeks when I have to switch it off, Irish music can get a bit depressing. That’s why I love Kirsty MacColl’s final album so much – the hit singer took inspiration from a trip to Cuba and blended the upbeat Latin rhythm into her Celtic songs. Yes there are some sad songs (AutumnGirlSoup), but the story telling (like ‘England 2 Colombia 0’, a catchy song about adultery and lies) is perfect. This album is perfect for dancing around the kitchen on gray gloomy days. And then there are the books. My two favorites are Classic Celtic Fairy Tales by John Matthews and Irish Folktales by Henry Glassie (Editor) Classic Celtic Fairy Tales is beautifully illustrated, with each story followed by a notes section filled with references. Irish folktales contains well documented stories arranged by topic (faith, war, ghosts). Each story is preceded by the first name of the teller and the county they lived in. This anthology with stories from 1825 to the ‘present day’ is perfect when I want to pull a piece of folklore from a specific time or place. These two are the books I go to when I’m looking for a new monster or need inspiration for a character. Movies and TV shows are great, but these more scholarly treatments feel closer to the source. Someday, if I’m lucky, I’ll get to visit my grandmother’s home town in Ireland. I imagine the stories I hear there will be the ones in these books, with dangerous, beautiful fairies, brave men, cunning women, and a lot of magic. I plan to capture them all in stories of my own. I don’t talk much about my halcyon days at Flagler College. I cherish them, but keep them close. My best friend from school, Donalyn Frank, died in 2010. The Mermaid and the Murders is actually all about Donalyn, but I keep that close too. When hurricane Matthew ripped through Saint Augustine, I searched out news of the place where I finally fit in, the school where I learned so much, and the hometown I’ll always miss. Pictures of sharks swimming over the sidewalk where I used to walk and my precious college drowning left me filled with a sense of fealty, even as I knew my ties to that idyllic place were slipping. After all, my Flagler College mug is fading. 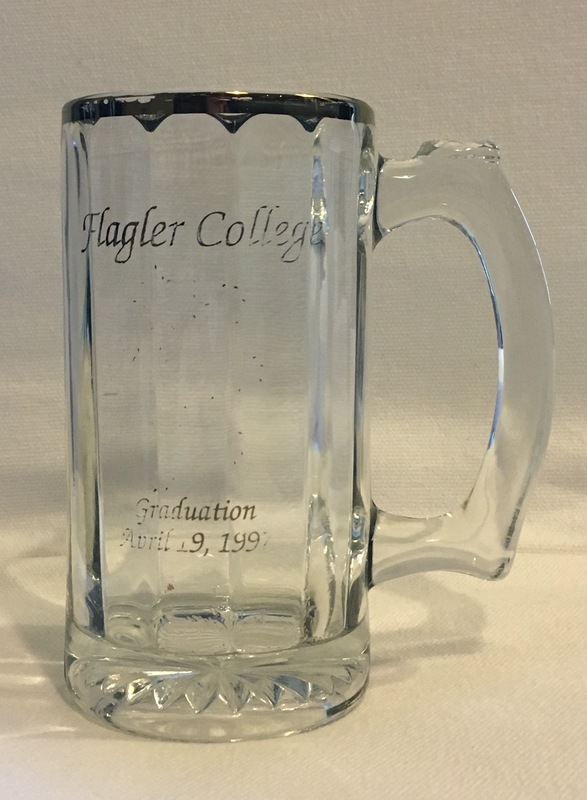 About twenty years ago, every Flagler College graduate got a mug with their graduation date written in gold script, beneath our lion mascot. I kept it safe through my many moves, wrapping it in a dishtowel, then putting it in the plastic box – not trusting bubble wrap and cardboard. When it got unwrapped it went on a shelf to be admired, or in one very small apartment, on my writing desk to hold pencils. In nineteen years and nine moves I never drank from it. It was too special. After a trying day I found myself wishing for a drink. Unfortunately, I wished out loud and an amazing waitress offered to get me one. When I explained that I can’t have alcohol and shouldn’t have caffeine, she summoned the bartender, Patrick, who took my problem as a challenge. He customized not one, but two ‘mock-tails’, cocktails without a drop of alcohol, and sent them to the table. 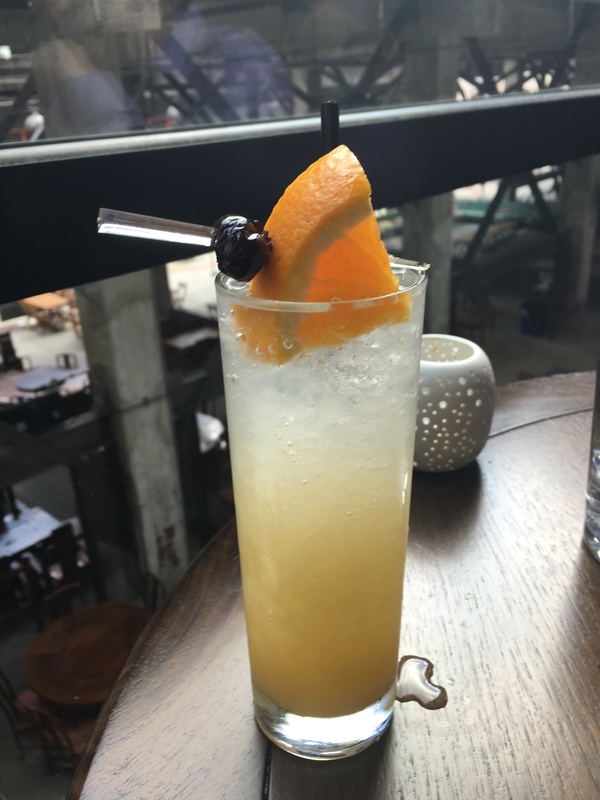 One of them turned out to be bliss in a glass, a nirvana of sweet but not too sweet, garnished with a Luxardo cherry. As rare as they are wonderful Luxardo cherries come from one place in the world, a lucky town in Italy. Dark, sweet, and tart without a hint of bitter, there’s no good way to explain the bliss of savoring a Luxardo cherry. The juice is just as impeccable. Before I left the restaurant that night, I’d written Patrick into a novel (he’s on page 68 of Fire in Her Blood), christened the drink a Rachel, and bought my first jar of Luxardo cherries from Amazon. They aren’t cheap – twenty-five dollars gets you about thirty-five cherries – but mixing the sweet cherry syrup-juice they come packed in with club soda is my favorite way to turn a bad day around. Which brings me back to my Flagler College mug. I reverently wrapped it again for our third move in nine months (2016 had a lot of moves even for me) put it in a box and promptly forgot it existed. I didn’t have as much counter space for knickknacks in the new place. I expected it to stay in the box until the next move. But my cherry cocktail needed exact measurements, a ratio of cherry syrup to club soda that produced the perfect blood red drink sensation, and all my glasses were opaque. 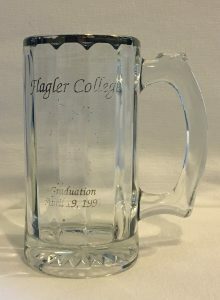 The Flagler College mug was unwrapped at Halloween, and ruined by Christmas. It seems the oh-so-carefully preserved mug was better as a pencil jar than an actual mug. Washing it chipped the gold enamel finish, and after one particularly hot bath of suds, the proud Flagler loin was wiped away by my dishcloth. Gone. The lettering has made it a bit longer, you can still my graduation date but the year is fading. I suspect it will be a nothing but a glass mug in another few months of service. I’ve had more joy using that mug in the last three months than I did carrying it for nineteen years. In all that time it could have been lost or shattered, but instead it remained pristine but spiritless. When I unknowingly began its destruction, I made it part of a ritual to bring comfort on bad days. Happiness has a price, I guess, and I’ll only get to use the magic of my Flagler College memories a little longer. Not using the mug might have preserved it, but I realize now, preservation isn’t the always the best way to honor a thing you love. Sometimes using something up, hugging the stuffing out of the teddy bear, staining the quilt with picnic dirt, and loving something so hard there’s nothing left to love, is the best thing you can do. Friday night was a sacred time in my childhood: movie time. Every Friday afternoon, usually around 4:30, my folks would pick a film. We tended to rush to the theater with barely a minute to spare. A lucky kid would be sent to the lobby for a large soda and a larger popcorn. We could never afford separate drinks and snacks for everyone, and besides, whispering “pass the popcorn” down the row was half the fun. Sometimes my brother and I would split a candy bar, usually the extra-large Kit Kat. As the lights went dim I lost myself in the story. I’m lucky that the story didn’t end when the lights came on. My family didn’t just watch movies, we dissected them. My father would pose deep questions, “what would have happened if…” and then challenge us to come up with a better ending or a better story all together. The worse the movie the more we would fight it out, who could come up with the best ending, the right twist on events? Without the aid of Google and Wikipedia, we were forced to get creative, drawing on what we knew. No ideas were condemned, but a lot were rewritten as the drive home became dinner, which turned into time to do the dishes. Usually by Saturday morning I’d rewritten something that took the studio months to make, positive I’d done better. Occasionally we wouldn’t agree on the subtle meaning of a foreign film or what the underlying metaphors meant in the Oscar contenders. A little disagreement is natural when you watch 52 movies a year – more in a good year. I think of those early exercises in writing and rewriting, finding motivation, and fixing flaws as the basis of my writing career. I don’t want to ever write a book that couldn’t be made into a good movie. I start writing them all by picturing scenes, then picking actors to play my characters. We all loathed February, with its deadly combination of no good movies and no good weather. We all looked forward to summer, when the darkened movie theater would bring respite from the unending heat. I’m cynical enough know to know that some of my movie excitement was brought on by a surefire combination of soda and candy, caffeine and sugar. But some of it was the story, the escape from the world I lived in, and the jewel-box way another world would expand. Walking out of the theater into the Florida sun was a blinding experience, brightness enveloping your vision until everything looked white, like re-entering the world through a hot cloud. I miss those moments, those seconds of whiteness before I realized I was still in my small town. That shift from the story I’d seen to my own story felt drastic in a way adulthood has ruined. I’m lucky that my last move simplified my life and brought me close to a wonderful movie house. I have high hopes for this summer, for Ghostbusters, Star Trek, Suicide Squad, and the Secret Life of Pets. For the first time in decades there’s a movie to see each Friday, and sometimes a second movie to watch on Sunday afternoon. I can’t wait to slip into those stories in the dark room and set aside the hot reality of life for the cool dark world of the movies. I decided to mark the turn of the century with an epic New Year’s Resolution. At midnight in 1999, I proclaimed I would run a marathon in the next year. I didn’t know how far a marathon was. I still haven’t made it. Running deceives a lot of people this time of year so if you made a running resolution, here’s most of the wisdom I’ve learned in 16 years and countless miles since then. A runner is real when she takes her first step. You can run on a treadmill, a track, a street, the beach, or in the woods. Don’t be ashamed of running or put it off until you reach some mythical size or shape. You don’t have to go fast or far, there’s no magic distance or speed that makes you a ‘runner’. Back in January of 2000, I started running without a plan or any direction. I wish I had used the Couch to 5K app. The program begins with a manageable walk/run program. Running portions start out around a minute, and a pleasant female voice tells you when to walk. It’s a great way to get started and in 8 weeks you’ll be ready to earn your first shiny medal. Not because they look good on your wall, but because achieving a goal is a great feeling. My first goal was the 2001 Walt Disney World Marathon. I didn’t train well, so I didn’t do well. I managed to finish a Half Marathon. That shiny medal makes me feel accomplished whenever I look at it. Pick a race and train for it, doesn’t matter if it’s a cheap road race or a fancy destination race, running toward something keeps you on track. I’ve become a fan of virtual races, where you run on your own and submit proof of your race (a snapshot of the treadmill’s display is enough) to get your medal mailed to you. I love stories – on tv, radio, podcast, or book. I’ve turned that into my running motivation. I have TV shows I only watch on the treadmill that pull me back to the gym. My latest addiction is the Zombies, Run! App. In each 20 to 40 minute story I’m Runner 5, charged with running for supplies or to ensure the safety of Abel township – the only piece of humanity left after the zombie apocalypse. The running goes at my own pace and the story comes between my favorite playlist. I’ve had plantar fasciitis in both feet, a hip flexor sprain, and runner’s knee. My runner partner for 2001 Marathon was injury free until she fell and broke her arm heading to the starting line. Running can make you feel like an elephant, huge and plodding. But it can also make you feel like a tiger: powerful, graceful, and strong. Your runs won’t always be hard, some days they’ll be effortless. A few miles can give you a mythical ‘runner’s high’ where the endorphins in your body make you feel better than ever, then the next day a few steps will bring you to tears. If you’ve decided to start running stick with it on the bad days, push yourself through the tough times, because the best miles are the ones you haven’t run yet. 5k = 3.1 miles, 10k = 6.2, a half marathon is 13.1, a full marathon is 26.2. Vaseline is great for spots that rub. A little caffeine before you run can be a nice boost (I like Coca-cola, some people like coffee). Dress for the outdoor temperature minus 20 degrees. You should be cold when you start out. Drink lots of water. Don’t run on a full stomach. Run safe – tell someone where you’re going and when you’ll be back. When you pass someone say “Oh your left”, just like Captain America does. Many people will tell you how to win at National Novel Writing Month (NaNoWriMo). They’ll quote best practices and articles, talking about support networks and plotting. All of that is very good advice. But I’m here to tell you that even if you don’t follow any of it, you can still ‘win’ at NaNoWriMo. And by winning I mean end up with a book contract. The end of 2013 was a hard time for me. My father died, my mother had serious health issues, I was hospitalized, and my heater broke in the middle of a snowstorm. The NaNoWriMo deadline had long since passed, but I realized if I didn’t challenge myself to get writing my creativity would drown under all the stress. I needed a challenge, even though the next NaNoWriMo was months away. Anti-Rule #1: NaNoWriMo happens when you make it. If November is a bad time for you, start your novel today or any day. If you like the discussion boards and support of a writing team NaNoWriMo Camp starts in June and August. It brings the same support and fun as NaNoWriMo in November with none of the holiday obligations pressing down on you. A lot of the teachers in my life prefer NaNoWriMo Camp in June when school is out for the summer. I planned to start my personal NaNoWriMo challenge on 2/1/2014, but got excited and started writing on January 27. 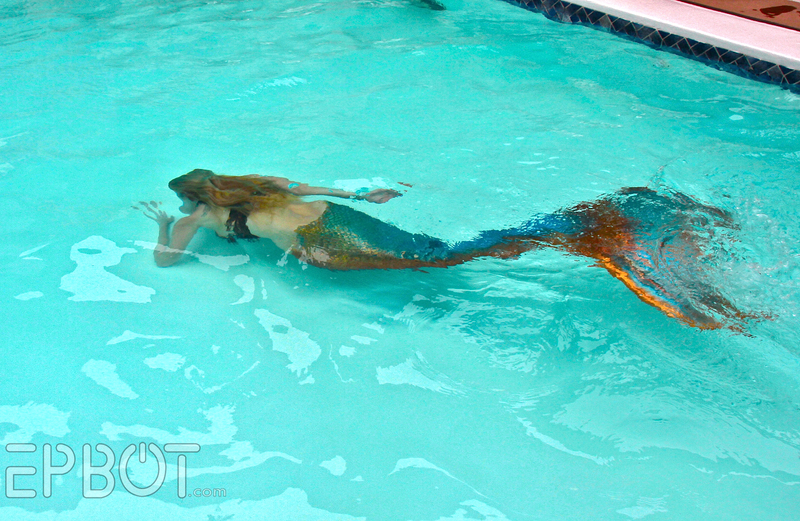 The mermaids there were exactly what I wanted – desirable, otherworldly, and deadly. Young women are often admonished against expressing their sexuality and told “good girls don’t do that sort of thing”. I wanted a character who struggled with her own powerful sexuality, who wanted to fit in but was constantly swayed by strong emotions the world didn’t expect her to have. Her name is Danika. Her friends called her Danny, and for my private NaNoWriMo I thought about her every day. I challenged myself to two thousand words a day for each of February’s twenty-eight days. Anti-rule #3 Finish your novel when it’s done. I kept writing through March and into the first weeks of April. (Danny first appeared on the blog in April.) It turned out that I wanted to write more than the NaNoWriMo prescribed 50K words. I wrote about Key West disguised as Danny’s beach-side town Playa Linda. My Aunt’s house on Stock Island became Danny’s house. My favorite high school books became her favorites. I filled that manuscript with a thousand sunny details of life in a tropical town while the cold winter months passed away. Anti-rule #4 Edit whenever you want! NaNoWriMo focuses on getting the words on the page, so the rules tell you not to edit as you go. That means leaving something in place that doesn’t work and trying to write around that mistake. For me, it became too confusing to write chapter 10 based on what I wanted chapter 8 to be instead of what it was. I’d rather go back and rename a character than keep a list of things to correct when I’m done. I enjoy re-reading my work on Sunday night, planning out what scenes I’ll write for the week and making little changes. I don’t want to give up that ritual. People joke that NaNoWriMo should be followed by National Novel Editing Month, and I agree. When I finished the Mermaid manuscript I let it rest for a month before doing a first edit. Then it was sent it for a beta read. That caused another round of edits, which were followed by two rounds of paid edits, one with a college student for YA voice and one with the amazing editors at Quail School Media. Finally it felt polished enough to send out to editors. Don’t leave your manuscript in a box. While the editors were reading The Mermaid and the Murders (the current working title) I started another manuscript. More than a year after my personal NaNoWriMo finished, the Mermaid and the Murders was out on submission and I did my best to forget about it. Months passed and I never managed to put the story out of my mind. 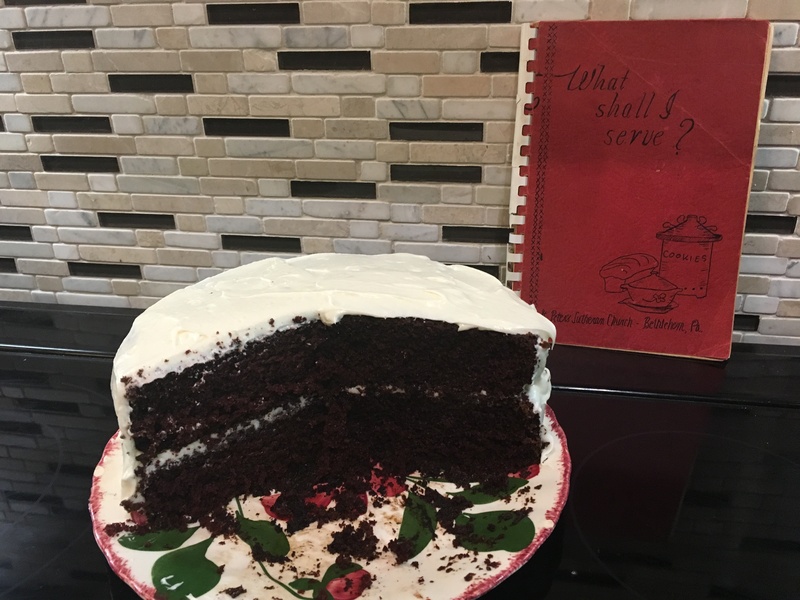 So this November, I threw in my hat for the real NaNoWriMo focusing on a a cozy mystery about a group of quilters who dabble in magic spells on the side. As my story reached 10,000 words, I got news that meant I would need to bend those NaNoWriMo rules again. My mermaid book, that rule-breaking not-really- NaNoWriMo manuscript got a contract. Right in the middle of the real NaNoWriMo I recieved my editorial letter. I’m excited to dive back into the world of mermaids and I’m happy that my (personal, not at the right time) NaNoWriMo was a success. If you’re participating right now, I hope you succeed. If you’re not participating, remember that any month can be NaNoWriMo or, if you don’t write, any month can be the one you accomplish your goal. As I type these words a gentle rain falls softly on the world outside my window, unlike the rain last night, that one tip-tapped on the roof until the middle of the morning. We haven’t had a good soaking rain yet, one fierce enough to get this Florida girl to open an umbrella, but there’s a hurricane on the way, so it’s coming. The anticipation is hard for me, the anxiety, the questions no one answer, and the powerful reminder that human beings are not as powerful as we imagine. I’ve lost track of how many hurricanes I’ve survived. I remember the bad ones. Frances hit just before DragonCon, causing the most surreal sixteen hour drive of my life. Andrew ripped away houses leaving brown scars you could see from the highway no matter how fast you went. Charley chewed through roofs and every other house wore a blue tarp for months. Erin arrived the day a surgeon removed my wisdom teeth. With limited water and no electric, I developed an infection and passed the storm hallucinating with fever. 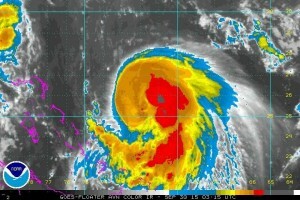 Despite the hardships, I’ve always appreciated the raw power of the storm, the beauty of it. My father and I would head to the beach after the all clear, searching for treasure churned up by the waves, watching the wind rip the foam off the surf. One our way home we’d stop and help people. One year I helped my favorite pizza joint take down the heavy plywood that kept their windows safe. Before the storm came we helped neighbors batten down the hatches (literally) and put away possible projectiles like lawn furniture and ornaments. After it hit, folks with generators run extensions cords to refrigerators down the block, and people smart enough to have a gas water heater offer hot showers. Communities can come together in a magical way after a hurricane. Hurricane preparations always make me rearrange my priorities. Mentally packing my ‘go box’, a five gallon plastic bin I’d grab in the event of evacuation, makes me realize what matters. None of my clothes are important enough, nothing from the kitchen except food. The electronics only matter because of the things on them – family photos, manuscripts, scanned copies of documents we’d need to file insurance claims. The jewelry maybe, especially the few things I’ve inherited, but if it meant getting out in time or being trapped I’d leave it behind. I’d pack my quilts if there was room but even my prized 1938 sewing machine could be replaced. Hurricanes remind us what matters most. Someday I’d like to write a story about a hurricane, stealing pieces from my childhood like the way we went outside to play as the calm eye of the storm passed over us or the chemical smell of rainwater purified with exactly eight drops of bleach in each gallon. At age four I struggled to count the drops exactly, at fourteen I poured the much more dangerous lamp oil with confidence. Now I’m the one searching for batteries and picking out canned food, closely watching the forecast to see where it will land. It’s hard, but not impossible. Once you’ve lived through a storm, it becomes a part of you, especially the bad ones. You realize you have it in you to survive, to help others when the sky is falling, and move forward when the storm passes. How important is preserving the past? And which version of the past do we keep? When the paperback copies of Under a Blood Moon arrived I quickly snapped a photo of one on top of the original draft. Printed in March 2007 that draft only roughly matches the story in the finished novel. I intended to shred it the next day, not out of anger or malice, but because I didn’t need it any more. I mused about leaving the past to the past, and focusing on the future. But then I hesitated. A story will change with the telling, altered as people apply their own point of view. It changes more when the author writes a sequel or explains things in other works. One of my favorite series began with the heroine being saved from a pair of attackers by the (eventual) hero. In the first book she was alone and desperate. Later in the series we learn another person was watching the shadows. By the end of the series some seven people were there and only the hero moved to help. Critics were quick to point out the inconsistency, but does it really matter? I’m editing the second Mallory novel now. The third is ‘proofing’ and my mind is chewing on what will happen in the fourth. I’m tempted to re-read every word I’ve written, from beginning to end, before I start on that fourth story. It would give me a more consistent, more ‘correct’ version of the story but I want to write what’s in my mind now rather than trying to recapture what I felt then. 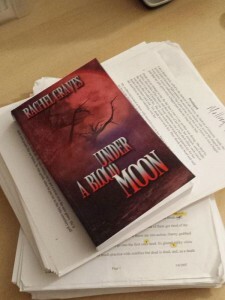 One of my first readers of Under a Blood Moon is a friend who I met at my day job. After reading the book she asked me an interesting question – would it bother me if Mallory was Black? There’s nothing in the text that specifically makes her White, and a reader might imagine her as a Black. I told her it wouldn’t almost instantly, but the more I thought about it the more I realized I want readers to imagine Mallory as Black, Latina, Asian, or whatever she looks like inside their mind. I want them to read my story and make my characters real. Which is why I finally shredded those first manuscripts. A story isn’t just words on a page, but an evolving idea. I don’t want to look back at what I might have meant but instead move forward toward what my stories can become. I want that more than I want to remember what the story once was. Holding on to the past leaves your hands too full to reach for the good things to come. When I left Florida I swore I would never go back in summer, a season that starts with 90’ temperatures in March and refuses to leave until late September. But I find myself compelled to keep returning to one of the hottest parts of the state – the shade-less ocean of cement known as Disney World. Thankfully, one place stays refreshingly dark and gloomy. No matter how many times I go through the Haunted Mansion, there’s always something missing. 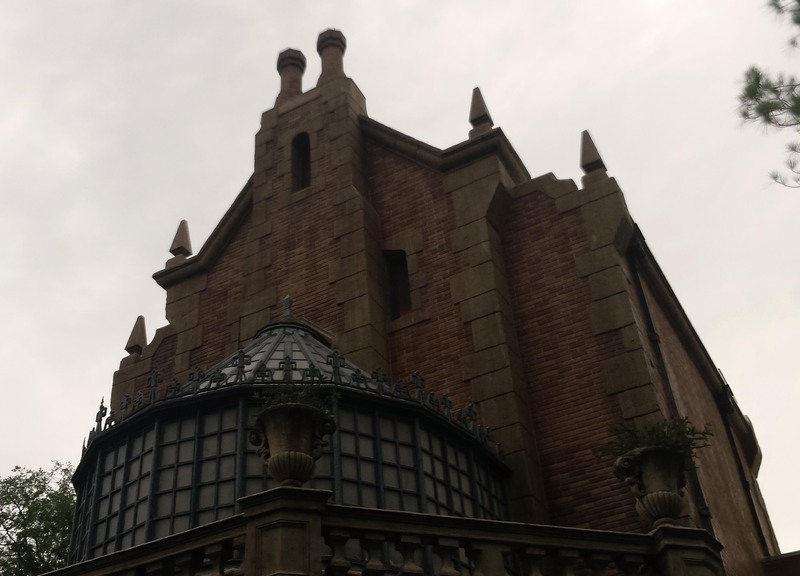 Even the backstage tour lacked a cohesive story of how the mansion came to be. How did the opera company die in costume? What happened to all those ballroom dancers to keep them twirling into eternity? The tale I heard as a child centered on a couple on their wedding day. Before the ceremony, they played a game of hide and seek. The bride hid in a trunk in the attack, but became trapped and suffocated. Her body was never found, and her empty hearse waits at the front of the mansion. Deeply depressed, her groom hung himself. 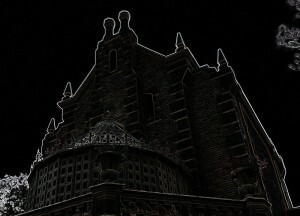 His body is revealed during lightening flashes in the first room. The bride’s ghost, with her glowing red beating heart, stood by the trunk in the attic. Not too long ago the ride was restructured and the story changed. The bride is now a serial killer who murders husband after husband. The outside of the ride was themed to include an unrelated murder mystery so subtle you’d need to be trapped in line for more than an hour to realize that’s what you’re seeing. The mystery is solved at the very end of the ride – if you keep a sharp eye out. I’m more in favor of the nods to the old tale, like the dog tracks that lead to the servant’s entrance outside of the cemetery. Those tracks make me think about the caretaker – who was he? What was his dog’s name? 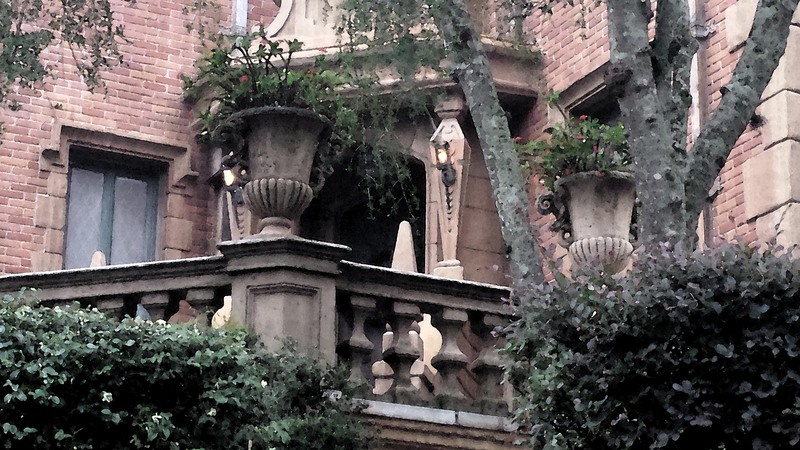 Where did they and all of the 999 Happy Haunts come from? That’s a book I’ve wanted to read for a long time, so I’ve started writing it. I’m moving the mansion from Florida to a small seaside town in North Carolina. I’ll be visiting Edenton, NC and a few other cities, trying to find one with the right feel. I’m hoping for a layer of genteel decay, a sense of beautiful bones under an aged face. A place that was golden once, but has gone gray with waiting, abandonment and wood beams, gingerbread work on houses that need a coat of paint. The story isn’t waiting for research, it’s forming itself in notes and drafts. A woman runs away from tragedy, going to a home she never knew she had. But homes are haunted with the things we could have done, the ghosts of the people we might have been. 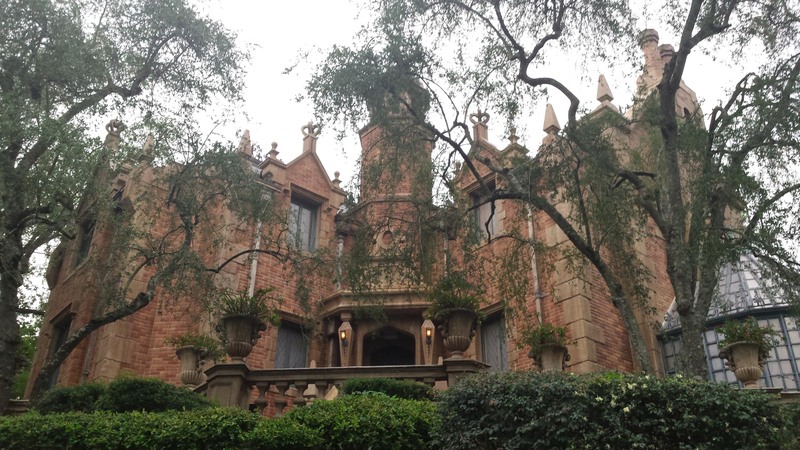 The poor dear doesn’t know it yet but she’s going home to a haunted mansion. Somewhere, right now, an athlete warms up, stretches, and mentally reviews his form, preparing for the big game. Americans everywhere do the same, following their rituals for things like icing beer or making onion dip from soup mix. The Superbowl begins in hours and it’s got football on my mind. My high school’s team ranked number one in the state for five years, earning the boys a 1.2 million dollar stadium. I walked past it on my way to English and Latin, classes held in permanently parked trailers euphemistically called ‘portables’. In Florida football is not a pastime but a religion. I have been greeted at 7am, in my bathrobe standing over a newspaper, by the shouts of a never-met neighbor who needed to know right away who won in overtime last night. I couldn’t tell him. Despite efforts by every member of my family I don’t care about the Giants or the Gators. Somewhere around age 13 they decided I didn’t like football because I didn’t understand it, and weekly lessons began. I sat on the couch absorbing knowledge of first downs, flags, and offensive lines wishing I could go read a book. It came as no surprise when I picked a college without a football team. My family gave up, sure that I hated the game. I agreed with them long enough that I made Mallory, the main character in my novel, a football fan. I didn’t want anyone to think she was a Mary Sue, a main character that is a stand in for the author, so I made a list of traits we wouldn’t share. She drinks Dr. Pepper, I drink Coke. She loves the heat, I loath it. So when it came to football, of course, she had special game day plates and favorite snacks.The sport was part of her life, something she shared with friends, and it brought her great joy. Oddly, the more I wrote about her and her team (the New Orleans Saints) the less I hated the sport. Mallory’s love of football was wrapped around her love for her father, who had been out of her life for years. Wearing his jersey, routing for his team, and watching the plays he’d taught kept her close to him. Somewhere along the way, researching those players and picking those traditions changed my own views about the sport. I still don’t have a favorite team. You won’t find me at a sports bar and I’ve never been to a Superbowl party, but I won’t joke about rabid fans, or belittle them for being excited. While I may not be interested in the sport, I’ve come to respect the relationships it creates and the happiness it brings. I won’t be watching today’s game for the plays, but I do want to see if Derrick Coleman invites those two little girls to the game again.